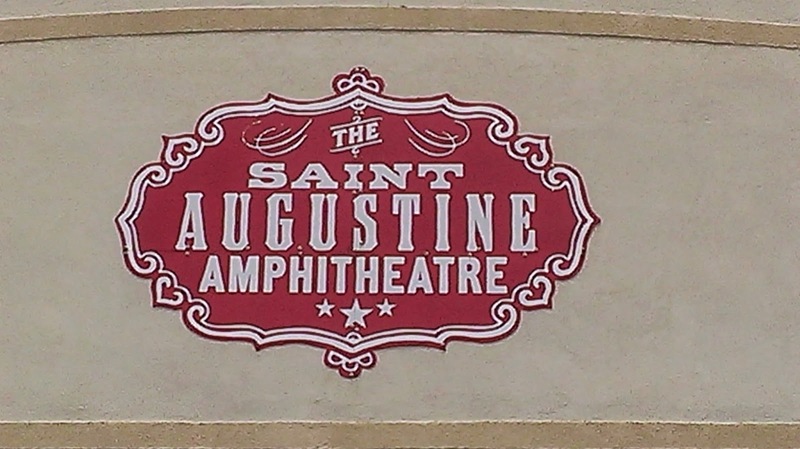 Mother Nature was smiling on the St. Augustine Amphitheatre last Saturday, April 25, for the 19th Annual Taste of St. Augustine. 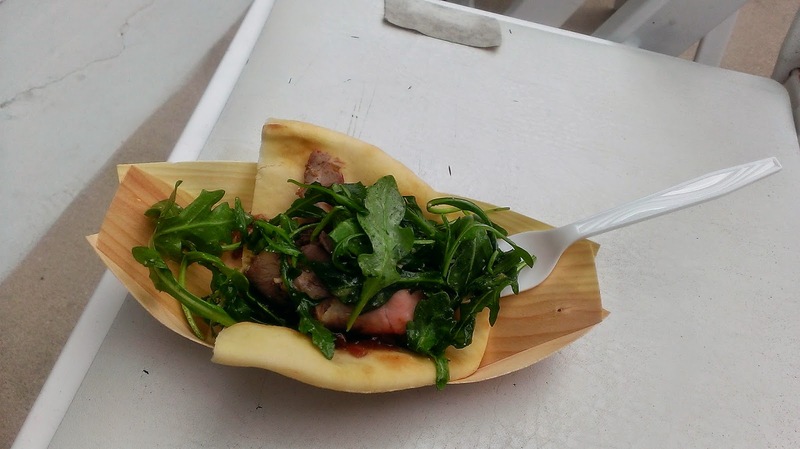 Not only is this a gastronomic food fest which featured over 30 local food and beverage vendors, the event kicked off with the Race to the Taste 5k. 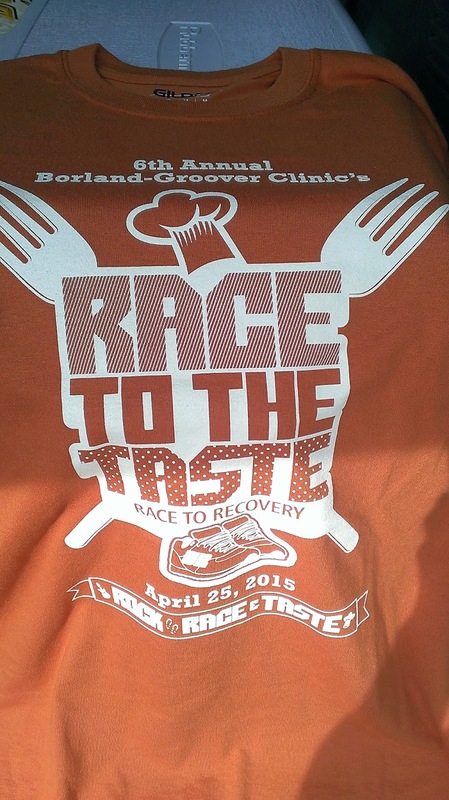 I participated in the 5k, and then proceeded to check out some of the flavorful and beautifully presented food items. I almost felt like I needed another 5k! 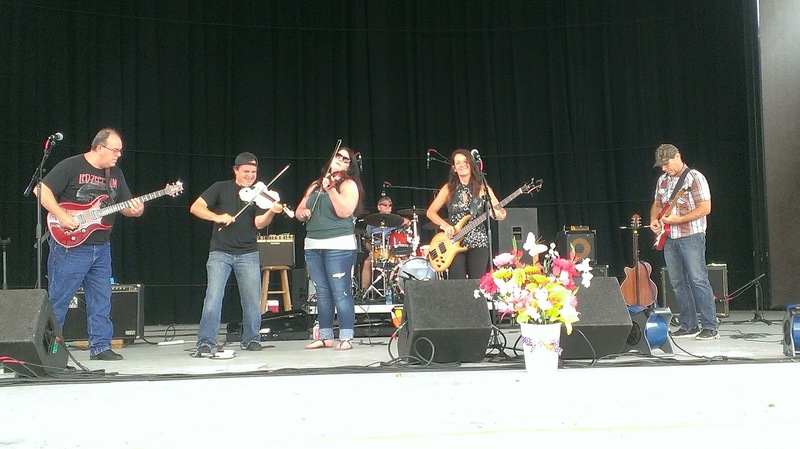 Two live bands rocked the fest attendees during the afternoon, and restaurants vied for awards. All in all, it was a fun day at a fun venue. The event, a fundraiser for Epic Behavioral Healthcare, was first held in the downtown Plaza, then moved to Francis Field, and has been held in the Amphitheatre since the venue was renovated about 9 years ago. According to Theresa Andrews, the Director of Development for Epic, and the coordinator of the event, this year's Taste featured a slightly re-vamped layout, which utilized additional space in the upper level grassy areas and overall provided a more "spread out" scheme to allow attendees to wander around more easily. I thought the set-up was friendly, and this was no small feat, in view of the Alan Jackson concert the night before. Volunteers began working on tent setup on Thursday, and everything else was done on Saturday morning. The food vendors began arriving between 8:30-10am, and the event was ready to go! The race started at 10:30am, and at this time parking was pretty easy. Pick up the race packet, and go. If you needed any motivation, all you had to do was see the first participant off the starting line: a wheelchair athlete. A few minutes later, over 250 runners/walkers took off on the course. I liked the course. It worked its way through parts of Anastasia State Park and several residential areas. Very woodsy and picturesque. And, what's this? 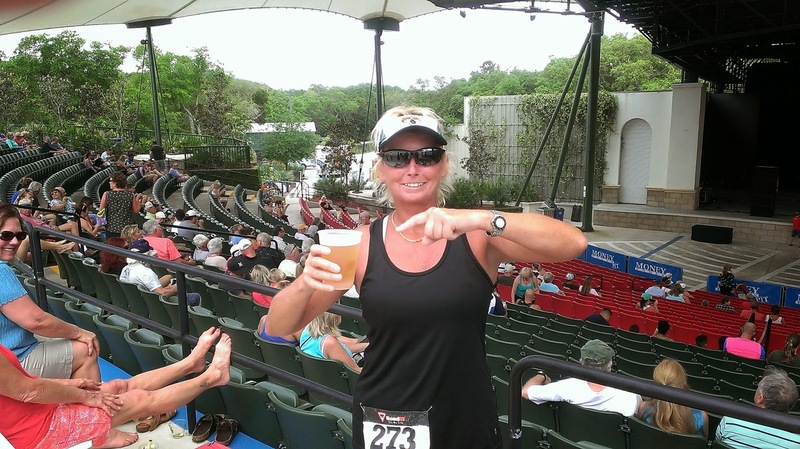 The race bib entitled adult runners to a complimentary beer at the Taste. Like I said on social media after the race, there must be something to this run-and-get-a-free-beer-thing, because I even had my personal best 5k, so I was pretty pumped! (And looking forward to that beverage). Taste tickets were $1 each, and most of the food/beverage items cost between 2-5 tickets. 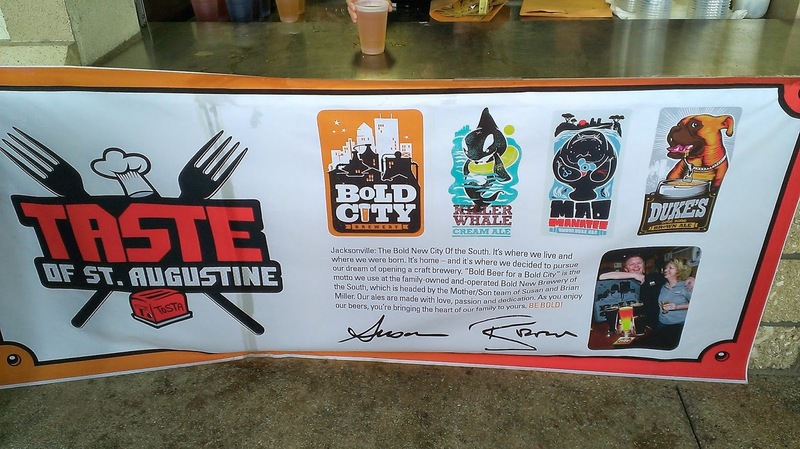 Bold City Brewery offered three of its main beers: Killer Whale Cream Ale, Mad Manatee IPA, and Duke's Cold Nose Brown Ale, at the main concession stand; Burkhardt Distributing offered Bud and Bud Light on the mezzanine level inside the amphitheatre; and The Raintree had White Sangria. Not one to waste any time, I first headed to the concession area for my refreshing Killer Whale, courtesy of my race bib. Now, it's time for food! Upon entry to the Taste, guests received a voting Ballot/map of vendors. A pretty impressive list! Check it out: The Raintree, Barnacle Bills, Coquina Beach Surf Club, Hong Kong Cafe, The Reef Restaurant, Scarlett O'Hara's, Aviles Restaurant, LaCocina International Restaurant, The Falafel Queen, South Beach Grill, Salt Water Cowboys, Creekside Dinery, Hyppo, Bold City Brewery, San Sebastian Winery, Starbucks Coffee, Papa Johns Pizza, LuLi's Cupcakes, Grower's Alliance Coffee, Black & Blue Grill, Salt Life Food Shack, La Floridita of The Floridian, Toucan Tina/ Alligator Farm, Burkhardt Distributing, Bonez Smokehouse, Redfrog & McToad's, Villagio at The Renaissance World Golf Village Resort, Casa Maria, and Meehan's Irish Pub. Whew! Where to start? Now, I couldn't sample everything that was offered, but all the food looked tantalizing! The Lump Crab Cake from Salt Water Cowboys was delicious! Nice drizzle of sauce: a delight. The Stuffed Mushrooms from Black & Blue Grill had my tastebuds in a frenzy; these were awesome! Well, guess what? What's better than a Bold City Brewery Killer Whale? ... Another one, of course! Then, I decided to give the Steak Sandwich with Arugula from Villagio at The Renaissance a try. This looked amazing. The taste matched the presentation, and it was one of my favorites. Chef at Villagio definitely got this one right! I even thought about what beer might be a good pairing for this one. The tanginess of the arugula and the hearty steak might be good with an IPA! Oh well, I digress. Now, while all the food is going on, the first band, The Red River Band, was on the stage performing a variety of country, rockabilly and rock hits. Nice touch with the "fiddles." Fun music! Alright, back to the food. The line at Bonez Smokehouse, a recent addition to the St. Augustine restaurant scene, was constant. People love barbecue, and Bonez offered its Pulled Pork and Brisket Sliders. I opted for the pulled pork, with a smathering of Sweet Sauce. Oh, yeah! One thing that I didn't try that I wish I had was the Asian Shrimp Tacos by South Beach Grill. They looked and smelled delicious. There was just so much to choose. Shout out to all the chefs! 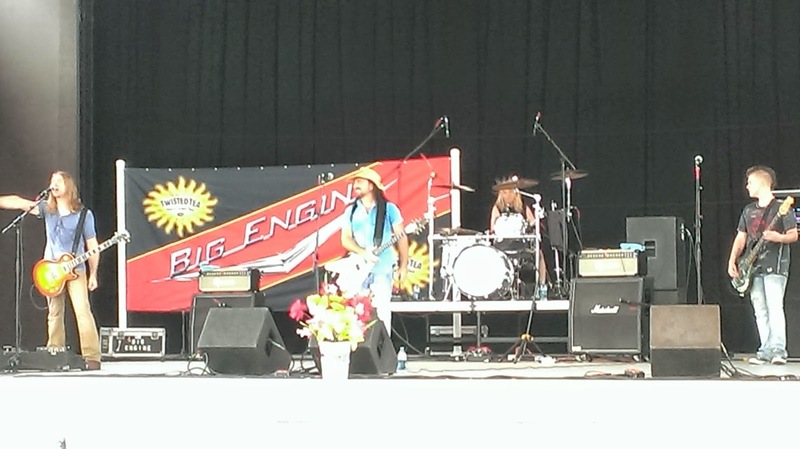 Around 2pm, the second band, Big Engine, took the stage, and rocked the crowd with blends of original music and classic rock tunes. And, if you were looking for dessert, you were covered there, too. I saw quite a few people wandering around with those famous popsicles from The Hyppo. 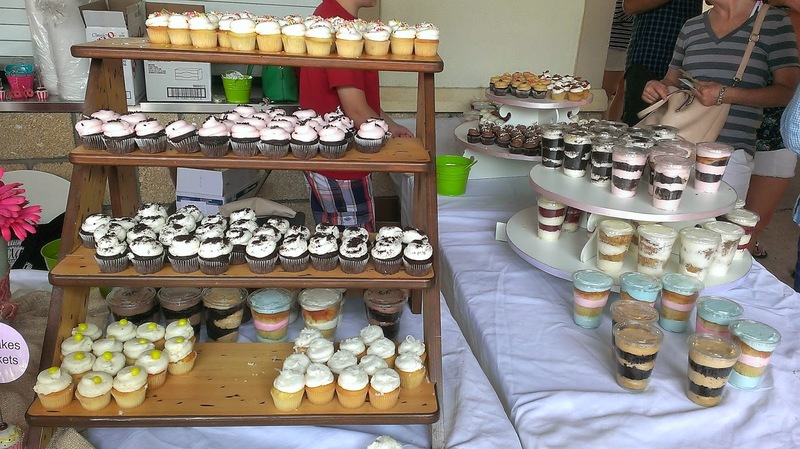 And, if cupcakes are your thing (and who doesn't love a cupcake), LuLi's Cupcakes had something sweet for you. While all the food kept everyone happy, there were a few event winners. People's Choice Award, as voted on the Ballots: Shrimp Tacos by South Beach Grill (see, I knew I should've had those!). 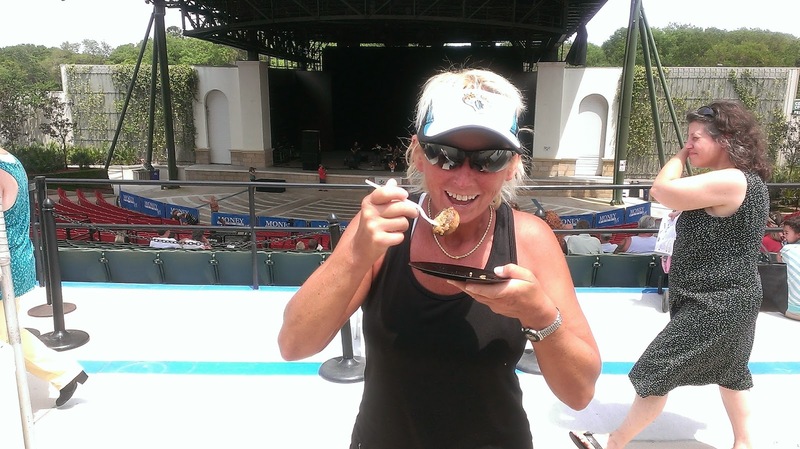 While attendance figures weren't available as of the time of this writing, Theresa Andrews estimated between 1000-2000 people convened in the Amphitheatre for the Taste. From what I observed, everyone was pretty happy and having a good time enjoying the deliciousness of the day. The Taste benefits Epic Behavioral Healthcare, and Theresa expressed extreme gratitude to the event's sponsors and attendees. In addition, Epic is very appreciative of the community support which it receives. Epic provides services to families, children and individuals in need of mental health and substance abuse assistance. 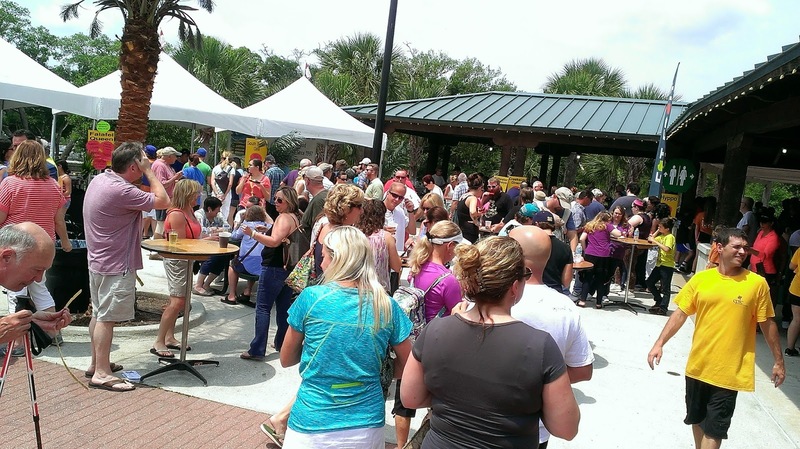 See you next year at The Taste of St. Augustine! Maybe I'll even be a bit faster in the 5k!